Dave and Stacy Sterling (aka ToT-LUG) have charmingly recreated the time-worn tale of the Deathly Hallows, as portrayed in the seventh Harry Potter novel. If you’re not familiar with the story, be sure to view the pictures in order, as Dave and Stacy have recounted the legend for us below the photos. 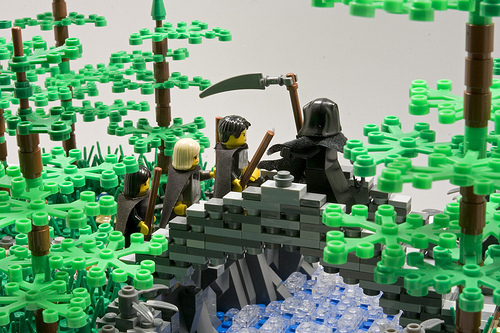 This scene was built as an entry for the 2011 MocOlympics, an annual competition which is bringing out a host of fantastic creations. It will be well worth your time to check out all the other great creations on display. Well, that’s that… We can’t do it better ! It’s a really good job they’ve done here, incredibly realistic, funny, and eventually I would say : breathtaking ! I especially love the Death minifigurine. I they don’t mind, I’ll use the idea !